The family of skilled craftspeople at Decore-ative Specialties are committed to providing you with much more than high quality Deco-Form® 3D Laminate, laminate, and melamine doors that accurately blend with laminate and melamine surface options. We’re also dedicated to developing product innovations that help you set your cabinetry apart from the rest and raise the bar in the industry for quality refacing products. That is why we have developed our one-stop shop for all your refacing needs. With our complete line of Deco-Form® products made from the same RTF material, your cabinets will match perfectly from top to bottom and can be ordered in record time. Deco Lam® applied to the face frames and end panels is a perfect match to doors, drawer fronts, moldings, base boards, and accessories. Finish it off with drawer boxes and our line of hardware to make your one-stop shopping complete. Decore-ative Specialties Refacing Program is not only a great option for custom cabinetmakers but it is an excellent option for homeowners. If your current cabinets are in good working condition and no major construction changes are needed in your space yet you want an updated style, color, or look then cabinet refacing may be the most economical and environmental choice for you. Your existing cabinet boxes can be used and new face material to match your new doors, drawer fronts, and accessories can be applied. Cabinets are measured, by a trained professional, for new custom doors, drawer boxes, surface materials, and accessories. Once you have chosen the color and door style you like, an order is placed. Countertops and flooring are protected and cabinet surfaces are prepared for installation of new materials. 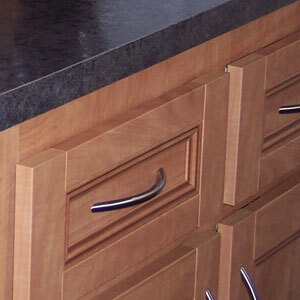 Trained installers reface your cabinet boxes with durable, new surface materials, in the color you selected. Your beautiful new doors, drawer boxes, hardware, and accessories are installed and the area cleaned and inspected.